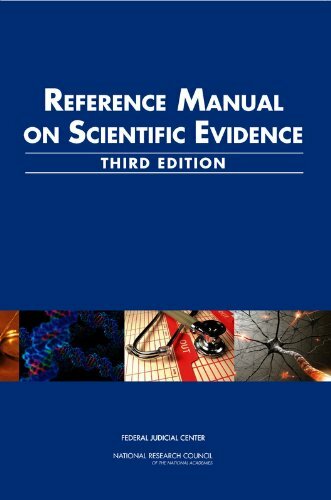 [PDF] Reference Manual on Scientific Evidence: Third Edition | Free eBooks Download - EBOOKEE! Description: The Reference Manual on Scientific Evidence, Third Edition, assists judges in managing cases involving complex scientific and technical evidence by describing the basic tenets of key scientific fields from which legal evidence is typically derived and by providing examples of cases in which that evidence has been used. First published in 1994 by the Federal Judicial Center, the Reference Manual on Scientific Evidence has been relied upon in the legal and academic communities and is often cited by various courts and others. Judges faced with disputes over the admissibility of scientific and technical evidence refer to the manual to help them better understand and evaluate the relevance, reliability and usefulness of the evidence being proffered. The manual is not intended to tell judges what is good science and what is not. Instead, it serves to help judges identify issues on which experts are likely to differ and to guide the inquiry of the court in seeking an informed resolution of the conflict. The core of the manual consists of a series of chapters (reference guides) on various scientific topics, each authored by an expert in that field. The topics have been chosen by an oversight committee because of their complexity and frequency in litigation. Each chapter is intended to provide a general overview of the topic in lay terms, identifying issues that will be useful to judges and others in the legal profession. They are written for a non-technical audience and are not intended as exhaustive presentations of the topic. Rather, the chapters seek to provide judges with the basic information in an area of science, to allow them to have an informed conversation with the experts and attorneys. No comments for "[PDF] Reference Manual on Scientific Evidence: Third Edition".